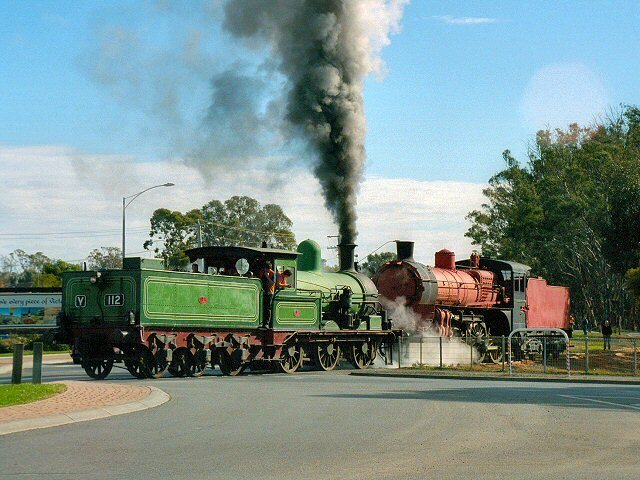 This photo is kindly provided by Trevor Staats and shows Y112 hauling A2 996 from Echuca Wharf to the station yard on 7 June 2004. The origins of the Victorian Railways Y-class lay with the decision by Kitson & Co, Leeds to place a 0-6-0 freight locomotive on display at the Centennial International Exhibition, Melbourne in 1888, together with a 2-4-2T suburban passenger locomotive. This marketing initiative proved successful as the Victorian Railways were clearly impressed with these machines, with both purchased after the exhibition and becoming the patterns for new standard locomotive types. Thirty examples of the 0-6-0 heavy freight design were ordered from the Phoenix Foundry, Ballarat, becoming the Y-class for main line heavy freight duties, while the 2-4-2T design became the E-class for Melbourne suburban passenger duties (represented by preserved locomotive E 236). The Y-class prove successful in service and accrued high mileages. They were inevitably superseded by more modern and powerful steam locomotives and a number cascaded into shunting and yard pilot duties, often with the addition of shunters steps along both locomotive and tender. Y 112 was one of the last in service when withdrawn in 1961. Fortunately it was saved for preservation and plinthed in central Ballarat, ostensibly in commemoration of Phoenix Foundry. I understand it is owned by the Sovereign Hill Museums Association. During the 1980’s, Y 112 was leased to Steamrail Victoria and restored to operation at an industrial site in Ballarat. Y 112 features an attractive lined apple green livery and has performed various rail tours around Victoria since restoration. It is normally based at the Steamrail depot in Ballarat East. For further information about the Victorian Railway’s Y-class locomotives (and indeed all early VR motive power), I recommend “Steam Locomotives of the Victorian Railways – Volume 1: The first 50 years” by Norman Cave, John Buckland and David Beardsell; this authoritative and details work also features many historical photographs and drawings. Wikipedia provides some further information about the Victorian Railways Y-class steam locomotives. 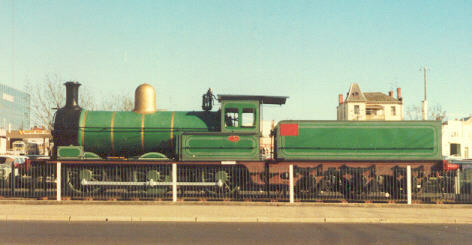 Y 112 as the webmaster first met her: plinthed at Ballarat in 1979. "A brief history of Preserved Rolling Stock of Victoria"
by Norm Bray, Peter J Vincent and Daryl M Gregory. Published by Brief History Books, PO Box 437, Sunbury, Vic 3429.